This kid is funny and over 3 million others think so to. He did an audition tape for Oprah Winfrey’s new OWN network and blew away the competition…well sort of, but we won’t get into that right now. His video went viral and that has been spun off into “Wingman” which is about dating and it’s rumored that he’ll have a new show on travel appearing on YouTube. With that many fans Zach’s projects are bound to be a hit. Zach did a 3 video series of his “rolling” around his home town of Austin, Texas….hey, I wonder if he knows Lance Armstrong? For more from Zach check out his channel on YouTube. I was looking online at YouTube for video to populate this page. Sarah True is sending some video links in the near future, but while looking I ran into someone that proves the point about humans having unlimited spirit. 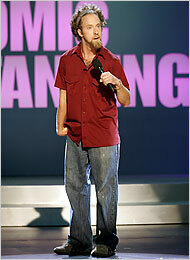 His name is Josh Blue and he is disabled, in fact Josh has cerebral palsey, but he won the Last Comic Standing competition in season four. Not only is Josh funny, but he plays for the U.S Paralympic Soccer Team. His goal is to bring positive attention to people with disabilities…he’s certainly doing that well, and hey….did I mention that the guy’s funny. Click here for a link >>. A New Kind of Listening is witness to Chris Mueller-Medlicott’s early, unrecognized attempts to communicate, and to his journey from a lonely, withdrawn adolescent to co-director of the theater group. Over the course of a year, Chris, a young man who has never spoken a word and has been mislabeled profoundly mentally retarded, breaks through into stunning self-expression. Using intimate footage of rehearsals and performances, synthesized voice recordings of Chris’ words, archival home videos and interviews with cast members, the film is a remarkable record of events culminating in a performance of “The Song that Greens the Earth” at one of Raleigh’s most prestigious theaters. The Tetra Society is a group of talented volunteer engineers that build solutions to the everyday problems faced by the disabled. Here is a great little video that shows just what they do and how they are helping the world. This is an abbreviated version of the documentary Relearning Everything, which offers an intimate and truthful portrayal of the lives of individuals recovering from traumatic brain injuries, a population served locally by the Chattanooga Area Brain Injury Association. Recovery is revealed to be a lifelong process in which many of the most basic tasks we all take for granted must be remastered—and in the strength and determination of these survivors is a powerful message of hope which applies to us all. This video is going to amaze everyone that watches it. CBS did a story not long ago about the Walkaide device and how it helped a woman injured in a snowboarding accident. This is a clear demonstration of how technology is helping those who need it most. The Walkaide device is strapped to the legs and sends electrical pulses to the nerves in the feet and legs that allow users more control of their limbs. Walkaide user, Tina Mann tells her story. Here is a link to the Innovative Neurotronics web site. Nancy Christy Heinen produced this video for Pathways to Independence. The video illustrates that a wheelchair– or any other disability– does not prevent a person from pursuing higher education and a future more rewarding than simply performing a job. We hope it will inspire, and educate, those with crucial influence on young people with disabilities, and that it will spark the imaginations and aspirations of students to the real world possibilities that can– and should– open the door to finding a path to a career. Enable is a project of Microsoft that has two goals…first it is about showing the world that people with disablilities can succeed in school and the workplace and secondly it shows how technology can level the playing field. Here are six videos about enable, the technologies and the people involved. A lot of the videos on the site right now are about technology and how it can help the disabled. One of our goals at New Horizons Independent Living Center is to use this blog to bring you positive news and stories of hope. This is just such a story. Many people live with depression and anxiety, but never heard of bi polar disorder. We are including some great videos here to help explain the disorder, break some of the myths and show you that there is help and hope. Watch this video and see how many cope with the disease. You will be surprised at some of the people that lived and thrived with bi polar disorder. See if you can name them all. Here is an inspiring video from Oprah about Amy, who protected her two kids during a tornado and was paralyzed. It shows a bit of what someone living in a wheelchair faces daily. CFS is a multi-system disease which causes extreme fatigue, muscle weakness, cognitive dysfunction, hypersensitivity, orthostatic intolerance, digestive disturbances, depression, poor immune response, and cardiac and respiratory problems. Studies have shown that patients diagnosed with “Chronic Fatigue Syndrome” are not taken as seriously as patients with the same symptoms but a different name for their diagnosis. Thus, the name CFS not only affects the quality of treatment patients receive, but the amount of money committed to research. We have our own support group here at NHILC which meets on the 3rd Thursday of each month. Our next meeting will be on November 17th. Here is a link to a useful site on CFS.